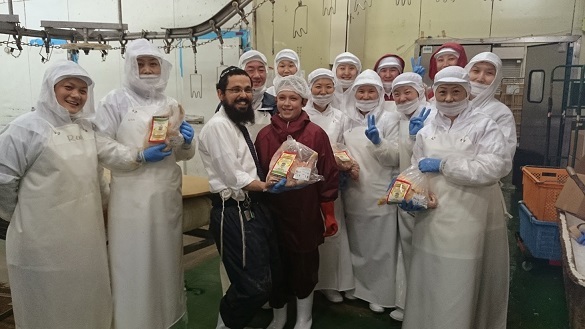 Chabad Japan has successfully organized shechita of kosher chickens right before Pesach. The chickens are free range, of premium quality, grown in southern Japan. There is a big demand for kosher chicken and orders have come from as far out as Hokkaido and Okinawa. We are very glad to hear the fantastic feedback of the kosher chicken consumers. We would like to thank Mr. Muto from Kosher Japan for his tireless effort to make Japan more Kosher. 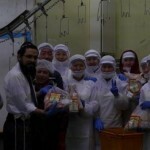 Rabbi Binyomin Edery puts a lot of effort in making Japanese products Kosher. There are few reasons, spiritual, moral, and practical. His philosophy is based on the Lubavitcher Rebbe’s directives to make every place in this world a spiritual dwelling place for G-d . It is therefore important to use the local produce and animals in the place where one lives, make them kosher and use them for good purposes. The other reason is to help the Japanese farmers and growers by buying their products. The Japanese are known for their hard work and superior quality of food and produce. Since we established Chabad House in Japan it is only right to help the Japanese society by using their products rather than import. Thirdly, importing lowers the quality of the food, as it is not as fresh. So for the kosher consumer in Japan, Kosher food made in Japan is the RIGHT choice. from Left to Right: Moshiach Edery who was in Japan for Pesach vacation, the Shochet, Rabbi Dickstein from Melbourne, Australia, and the gevaldige- duo, Mr. Muto and Rabbi Binyomin Edery, Chabad of Japan head staff.